Resort Harbour Properties in Sanibel Harbour caters to anyone seeking Sanibel Island, Cape Coral, or Ft Myers vacation rentals in a centralized location. Charming 4th floor waterfront condo above the tree line with fabulous views of the Gulf from the screened in balcony! Upgraded kitchen with newer cabinets, Corian countertops, newer appliances and tiled back splash. Our vacation rentals in Sanibel Harbour are decorated in an attractive Florida-style décor, with newer furniture. There's a HD TV in every bedroom plus the living room with a DVD player. There's one king in the master bedroom and two twins in the guest bedroom. 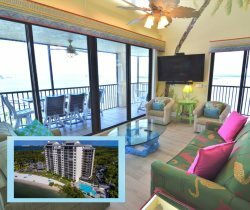 Walk out onto the balcony from the master bedroom and view the Gulf also from your window! You may have found this rental on HomeAway 4363844, HA ID 4363844, VRBO 4363844, or Vacation Rentals 4363844. Traveled with our 2 children ages 20 and 17. A wonderful time was had by everyone. We enjoyed the Marriott facilities. Seeing the sunset from our balcony every night was amazing. The condo exceeded our expectations - view and overall condo was excellent. We stayed with out 13 year old ball team, and we brought deer burgers and sausage to grill, and there wasn't a grill. It would be real nice if they had a grill area looking out into the bay. That was the ONLY thing we wish we had on our stay. Other than that , it was very nice !